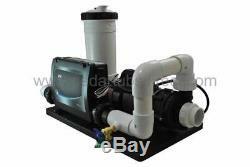 Balboa Spa System - 1.5 HP Pump, 1.5 Kw Heater. 50 ft filter (120 VAC). Complete Balboa Spa Pack System Complete with 1.5 Kw Heater, 1.5 HP Pump, 50 ft2 filter PRE-Wired and Plumbed! Time to upgrade your old spa pack hot tub heater? Balboa VS501z spa pack with LCD controller. Balboa (Pentair) 1.5 HP 2 Speed pump pre wired to spa pack. 50 ft2 hi efficiency filter. Light Kit harness with bulb. The easiest way to update your entire hot tub! Simply attach the return suction line and the jet discharge to the existing spa and you will have a brand new energy efficient spa system. The complete system comes in a small foot print measuring 29" length 15" width 21 high. Can be installed remotely or under a deck. Includes 8 ft extension cable for Digital top side controller. VL401 LCD Top Side controller. Built in programmable features such a cycle programming, sleep mode, economy mode and self diagnosis are just some of its features. Weather freeze ups are eliminated with the built in freeze protection system. 20 or 30 Amp Service. VS501Z pack including Stainless Steel portable heater with 2 heater tail pieces. 4 button light duplex digital control. 120 VAC 2 speed Balboa Ultimax Pump. One 3-wire pump/blower cable with AMP plug for optional blower or second pump. One 12 volt light wiring assembly with AMP plug. One loose 4-pin AMP plug with pins (to adapt a non-Balboa ozonator). Plasticized control instruction sheet; complete instruction manual for retrofit situations produced by Northern Lights. 50 ft2 high efficiency filter. Drain faucet valve for garden hose attachment. 2 piping for better flow. If you are looking for the best most reliable tub replacement system on the market, then Balboa VS501z with M7 technology it is. Their unsurpassed reliability is why Balboa is the world leader in Spa Pack manufacturing both in quality and reliability. Your #1 Hot Tub Parts Replacement Store! The item "Balboa Spa System 1.5 HP Pump, 1.5 Kw Heater, 50 ft 120 VAC" is in sale since Thursday, March 3, 2016. This item is in the category "Home & Garden\Yard, Garden & Outdoor Living\Pools & Spas\Spas & Hot Tubs". The seller is "hot-tub-parts" and is located in Winnipeg, Manitoba.